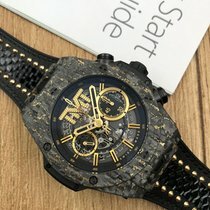 Hublot Big Bang Unico TMT Carbon Gold. 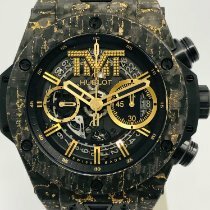 The Big Bang Unico TMT adorns its winning outfit with a strap in black calf leather enhanced with python and gold studs, transposing the codes of the famous shorts worn by Mayweather during his latest fight. The boxing champion’s gold appears in the details of the two watches. For the first time, 3N-gold-incrusted carbon fiber dresses the watch from its case to its bezel. This is a unique composite material; gold powder is manually inserted into the carbon fiber layers before being compressed. At 12 o’clock, the watch proudly displays the 3 letters TMT in appliqué. The sapphire case back bears the champion’s ultimate inscription, TBE, “The Best Ever”. Released in a limited edition of 100 pieces.